These varieties of wood are great for making pens, bottle stoppers, Christmas ornaments, small boxes, jewelry and many other craft items. 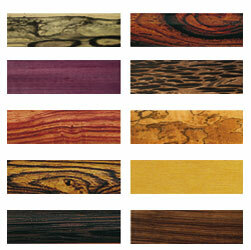 We also offer Bowl Blanks in a variety of woods for faceplate projects. They are listed in a table showing the sizes available in each species. A lot of these woods are exotic and may contain small checks. The sizes listed can vary slightly (up to 1/4") from the listed size. After receiving your wood keep it in a cool dry place out of direct sunlight. It is also a good idea to let the moisture content of the wood stabilize by keeping in it your shop for at least several weeks before turning it. Due to the unpredictable supply of some species, at times, we may be out of stock for longer than we prefer. In some cases if we feel the wait will be too long, we will not backorder the item, but will have the customer order again later.